Developing new leadership is important and necessary for the survival of every profession. Read what some emerging social work leaders think about how that will happen between today’s established leaders and those on the way up. When social workers gathered in Washington, DC, for the 2010 Social Work Congress, they identified leadership development as a key priority for the profession as it moves into the next decade. What many participants did not know was that the gathering itself was helping develop the leadership skills of 30 young social workers identified by their colleagues as emerging leaders. Members of this “30 under 30” group were invited to attend the congress not only to build their own skills and networks but also to serve as a voice for the young social workers on whom the future of the profession depends. Several of these emerging leaders recently talked to Social Work Today about why young leaders are so important to the profession and what educational institutions can do to help students prepare for leadership roles. A successful transition of leadership, these emerging leaders say, will require a give-and-take relationship with younger social workers seeking the wisdom and expertise of their older counterparts and more established leaders willing to accept the new ideas young people bring to the profession. Gilbert and others in the “30 under 30” group joined approximately 370 other social workers who spent two days preparing a set of imperatives to focus the profession’s efforts over the next decade. In addition to leadership development, the imperatives touch on areas such as collaboration, recruitment and retention, and ethically integrating technology into practice. A simultaneous Student Social Work Congress gave 400 students from around the country the chance to watch the proceedings online and offer their input on the selected imperatives. The “30 under 30” concept was the brainchild of Elizabeth Hoffler, MSW, ACSW, special assistant to the executive director at the NASW, one of four organizations that co-convened the congress. For Hoffler, a younger social worker herself, the reasons for making sure her contemporaries were included in the congress were both professional and personal. And, according to several “30 under 30” participants, the presence of younger faces is needed to help social work tackle the myriad challenges it faces. Social work is not unique from other professions in experiencing a leadership gap as large numbers of older, experienced workers retire. But for social work, this gap comes at a time when an economic slowdown, changes in the political landscape, and competition from other professions are threatening the future of human services. The demand for services is increasing while resources are shrinking. Low salaries and misperceptions about the nature of social work are keeping many people away from the profession. Nurturing young social work leaders is especially important in this time of rapid change because emerging leaders bring new approaches to overcoming these barriers, says Jenny E. Roberts Claxon, MSSW, CSW, a program specialist for the Kentucky Cabinet for Health and Family Services. “No one wants to think of themselves as getting older or having to retire, but we face so many issues in social work and to be able to continue to offer services, future leaders need to be coached and mentored,” Claxon says. The climate in which younger social workers operate is dramatically different from what their older counterparts experienced, says Kevin V. Lotz, LCSW, CASAC, ACSW, a social worker with Palladia Inc. and founder and director of Trinity Place Shelter, both located in New York. That difference means young social work leaders bring a vitally important perspective on issues such as student debt and increasing workplace pressures, he says. Younger social workers are especially well equipped to lead the profession at a time when rapid changes in technology are influencing everything from education to how therapy is delivered, says Toni G. Ahrendt, MSW, MPA, domestic violence programs service specialist with the Nebraska Office of Probation Administration. In addition, Ahrendt says, younger social work leaders may be able to bring new ideas on how to break down silo mentalities in social work and achieve the unity needed for the profession to have a forceful impact on policy making. Youth and energy won’t be enough to convince established social work leaders that their younger colleagues are ready to take on the mantle of leadership, says Jordan Wildermuth, MSW, program assistant at the Asthma and Allergy Foundation of America’s St. Louis chapter. 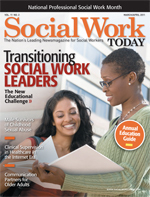 • Preparing students to deal with the day-to-day realities of social work: While field education is important, schools shouldn’t rely on it to provide all the pragmatic experience students need to navigate the high-pressure, often gritty circumstances in which many social workers practice, Lotz says. Such pragmatic information should be incorporated into leadership training in the classroom. • Getting students involved in professional organizations: Schools should encourage students to get involved in professional groups such as the NASW before they graduate, Claxon says. Such involvement helps students connect with established leaders and begin to advocate for the profession in the public arena. • Connecting students with professional mentors: Educational institutions must be proactive in identifying students with leadership potential and linking them with faculty, field instructors, or other professionals who can serve as mentors, according to Kyndyll Lackey, MSSW, LAPSW, youth employment program coordinator at the Nashville Career Advancement Center in Tennessee. “We, as social workers, can only learn how to lead if we’re watching those who already are leaders,” Lackey says. • Giving students tools needed to make the case for social work: Wildermuth believes many programs, especially at the undergraduate level, do not stress program evaluation and grant writing enough. Every social worker needs these skills, he says, especially at a time when social workers are feeling increasing pressure to demonstrate outcomes and compete for resources. • Nurturing leadership at all levels of social work education: Leadership development isn’t just for graduate-level students, Lotz says. “I believe our profession is too ‘MSW degree centric,’ which does not fully capitalize upon the value and potential of BSW education and the pivotal roles BSW-level social workers could play in building new leadership,” he says. Schools could offer continuing education classes in topics such as financial management and human resources for social workers who started their careers in clinical work but have been promoted to roles in agency leadership, Ahrendt says. Many social work schools are taking such advice to heart, working to develop leadership in ways that go beyond the experiences students may have in field education. For example, faculty at West Chester University in Pennsylvania are encouraged to work directly with students and invite students to partner with them on activities such as attending meetings and presenting at conferences. These activities give students a chance to experience success in social work and model the behavior of the faculty, says Mildred Joyner, MSW, LCSW, BCD, a professor of social work at West Chester University and director/chairperson of the university’s undergraduate social work department. Texas Christian University helps its students develop leadership through connections with professional organizations. The school requires its students to join the NASW, and many students have served on boards and committees of the organization’s state chapter. Such experiences help students recognize the power they have to shape policy at the university, state, and national levels, says Linda S. Moore, PhD, ACSW, LMSW-AP, a professor of social work at Texas Christian University. Senior BSW students in one of Moore’s classes experienced this firsthand when they participated in the Student Social Work Congress. One of these students, Su Harz, LBSW, says being able to watch and comment on the proceedings gave her and her fellow students real-world knowledge of the challenges social work faces while empowering them to advocate for their ideas on how the profession can meet these challenges. It’s the type of opportunity more educational institutions should give to their students, Harz says. Despite their desire for social work schools to become more leadership focused, several of the “30 under 30” participants agree that young social workers who truly want to lead will have to do much of the required work themselves. “The responsibility of younger social workers to develop into social work leaders has, unfortunately, increasingly shifted from schools and employers onto the individual,” Lotz says. How then should potential leaders respond? Lotz and other emerging leaders agree that the key is to get involved, whether that be through joining professional organizations, networking with other professionals, keeping up with literature, or attending training sessions. It isn’t necessarily an easy process. Developing leadership skills can require the sacrifice of a lot of time and a commitment to forcing oneself to step out beyond what is familiar, Ahrendt says. • Business of social work: Infuse models of sustainable business and management practice in social work education and practice. • Common objectives: Strengthen collaboration across social work organizations, their leaders, and their members for shared advocacy goals. • Education: Clarify and articulate the unique skills, scope of practice, and value added of social work to prospective social work students. • Influence: Build a data-driven business case that demonstrates the distinctive expertise and the impact and value of social work to industry, policy makers, and the general public. • Influence: Strengthen the ability of national social work organizations to identify and clearly articulate issues of importance to the profession with a unified voice. • Leadership development: Integrate leadership in social work curricula at all levels. • Recruitment: Empirically demonstrate to prospective recruits the value of the social work profession in both social and economic terms. • Retention: Ensure the sustainability of the profession through a strong mentoring program, career ladder, and succession program. • Retention: Increase the number of grants, scholarships, and debt forgiveness mechanisms for social work students and graduates. • Technology: Integrate technologies that serve social work practice and education in an ethical, practical, and responsible manner. For more information about the Social Work Congress and to read final reports from the congress and the Student Social Work Congress, visit www.naswdc.org/2010congress.